Morbid obesity continues to be a major obstacle in patients undergoing laparoscopic colon surgery. A review of the surgical literature repeatedly demonstrates morbid obesity to be one of the most common causes of conversion in patients undergoing laparoscopic colectomy. Particular troublesome is the fact that it is these patients who perhaps could benefit the most from a laparoscopic approach. A retrospective review was performed of patients who had undergone laparoscopic colectomy in our department to determine whether the HALS technique could be successfully performed in morbidly obese patients without significant conversion rates, while maintaining the benefits of laparoscopy. 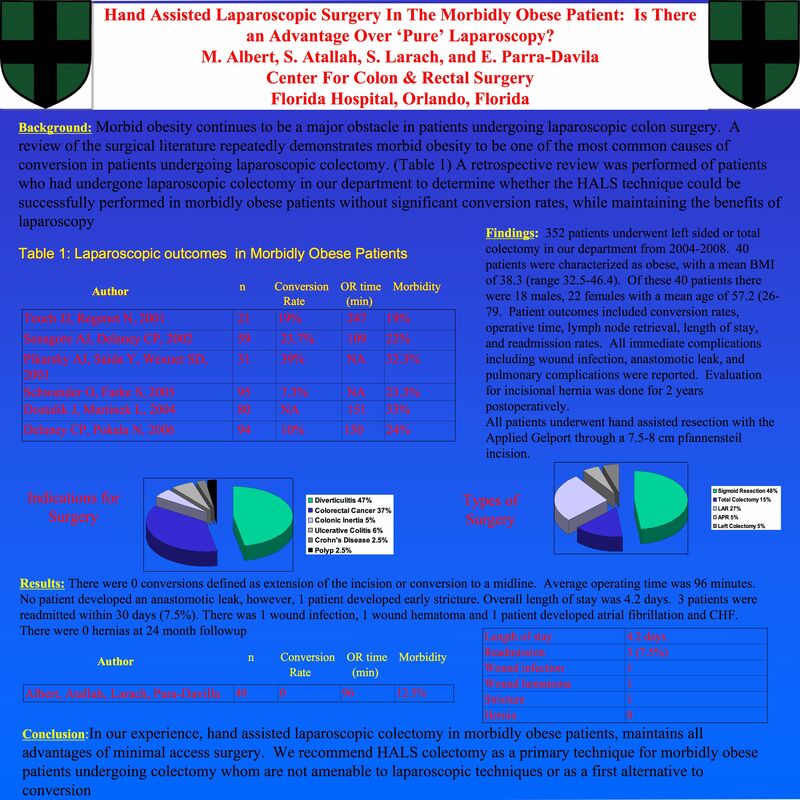 From 2004-2008, four hundred patients underwent laparoscopic sigmoid resection, anterior resection, total colectomy, or restorative proctocolectomy. Of this group, 40 were categorized as being morbidly obese (bmi>40), with a mean BMI of 42.5. Length of stay, wound infection, incisional hernia, anastomotic dehiscence, PE/DVT, as well as pulmonary complications was calculated. Conclusions: In all 40 patients, HALS was completed through a 7.5 – 8 cm pfannensteil incision without any conversion (extension of the original incision or conversion to midline). Morbidly obese patients displayed significant benefits of a minimally invasive approach with a lengthy of stay of 4.1 days. Wound infections occurred in 6% of the patients. At 2 years follow up there were 0 incisional hernias. No anastomotic leaks occurred. 1 patient developed a pulmonary embolism despite postoperative prophylaxis and an IVC filter. No patients required an ICU admission, mechanical ventilation or documented pulmonary infection. In our experience, hand assisted laparoscopic colectomy in morbidly obese patients, maintains all advantages of minimal access surgery. We recommend HALS colectomy as a primary technique for morbidly obese patients undergoing colectomy whom are not amenable to laparoscopic techniques or as a first alternative to conversion.